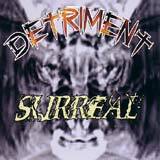 Detriment was formed in September, 2001 and is based in Long Island, NY. Their sound is a well balanced mixture of thrash and traditional heavy metal, with some occasional death metal vocals included. There aren't many bands mixing these styles of metal these days, so an album such as Surreal strikes me as refreshing. The core ingredient of Detriment's sound is strong guitar work. Forceful, chugging riffs drive the songs, while a strong bass presence provides a solid foundation for the sound. Of course, you can expect a well-placed solo throughout each of the songs as well. I would imagine that these guys put on one hell of a live show as the guitar work alone will have you head banging right along in no time at all. Vocalist Rob Malvagno runs the gamut from a traditional metal delivery (ala Wrathchild America) to a death metal delivery during the aggressive parts, and even adds a few Halford like wails throughout the album. He has a knack for adapting his vocal style to fit the music. As a result, the band is able to mix traditional, thrash, and death metal elements into their sound with ease. The music is never boring, as there is plenty of creativity in the songwriting to ensure that the band never repeats themselves. The production is a little bit thin, but it certainly does not compromise the sound of the music. In fact, some may find the that production appropriately gives the music more of a underground sound. Surreal is a solid album that fans of loud guitar driven heavy metal should check out. Loud, driving guitars and a versatile vocalist are the main selling points of this album. The band has some sound clips available on their webpage (linked above), and they are selling this CD at a very reasonable price. If you are a fan of old school heavy metal and thrash, I'd advise that you check this band out.